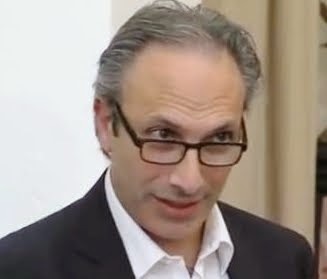 Development Horizons by Lawrence Haddad: Anaemia Amnesia? Why does no one seem to care about it? 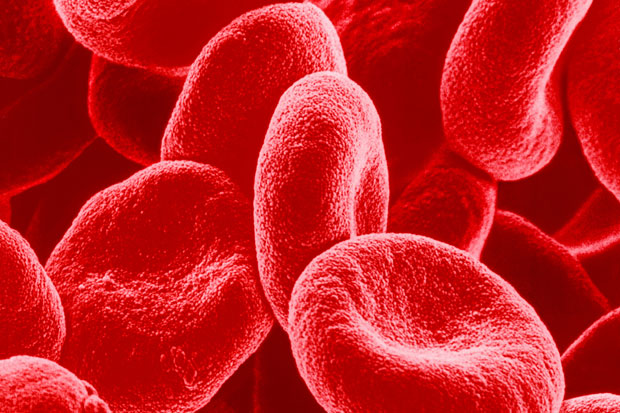 Anaemia Amnesia? Why does no one seem to care about it? OK the title of this blog is perhaps a bit hyperbolic (I know plenty of people who care about it) but I just don't get the lack of urgency on anaemia. 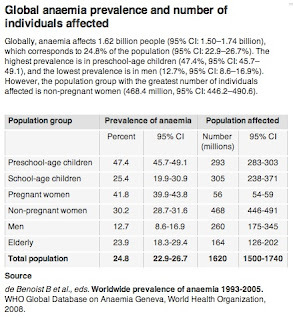 * A quarter of the world's population suffers with anaemia (see table on right from WHO). 1.6 billion people! * Levels are high all over the world: For girls/women 15-49 it is 15% in the UK, 12% in the US, 19.6% in Brazil, 22.5% in Indonesia, 48.1% in India and 48.5% in Nigeria. * For children the data are even scarier: 47.4% of all preschool children--293 million kids. * The rate of progress in reducing anaemia is very slow. As the GNR 2015 highlights only 5 countries out of 185 are on track to meet the WHA 2025 target of reducing the 2012 base rate by 50%. This is by far the worst performance of any undernutriiton indicator in relation to the 2025 targets. By way of contrast 39 countries are on track to meet the stunting target. And yet, I don't see or hear the outrage. Maybe I am looking in the wrong places. If I am please tell me. What might be the causes of this lack of outrage? I am not an expert, but let's speculate. * Maybe the fact that it affects women so disproportionately, and yet men tend to be in powerful decision making positions. * The corollary to the previous point means it requires multi-sector coordination to address this effectively: infection control, food and diet interventions, iron supplementation, prevention of other micronutrient deficiencies etc. Such coordinated action is a challenge, but we now accept the need for it as the norm. * The manifestations are not as obvious as they are for stunting or wasting and are certainly not as easy to assess. Invisibility and inertia rule. There are probably lots of other reasons (please share). This is the year of Women Deliver: 16-19 May 2016, the world's largest conference on the health, rights, and wellbeing of girls and women in the last decade. Surely the time is right for a major new push on this condition? With such high levels of anaemia women's ability to deliver is diminished. We all need to deliver on a commitment to accelerate declines in anaemia rates for women, children and men. We look forward to your help building momentum on anaemia reduction!